Be sure to mark your calendars for Sunday, Nov 10th for our Annual Potluck Dinner in the Lower Church starting at 6 pm! To make sure that we have an appropriate mix of food items, we are suggesting the following breakdown of food categories. However, if you have a particular specialty that you would like to share that is not on your day listed below, go ahead and bring that instead. If you and/or other members of your family are scheduled for more than one day of the week, choose either category. If you are a substitute adorer, choose any category you would like. We will provide additional drinks and paper products and eating utensils. Please fill in the form to RSVP. WOW!! What a nice website and fantastic evangelization tool. I can refer people to the website when talking about the chapel so they can see for themselves. The website is beautiful ! 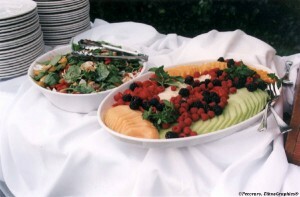 The website made it easy to register for the pot-luck, it will be a great communication tool. Thank you both for all you do in His name.